A (wo/)man may do an immense deal of good, if (s)he does not care who gets the credit for it. While we agree with the theory behind this old teamwork saying, we still think you can sneak a little credit for bringing the new Xobni for Teams to your colleagues today! Go to Xobni for Teams to get your whole team up and running with Xobni in minutes. Get all the benefits of Xobni and Xobni Pro for a group of people—bundled neatly into a single monthly or annual bill. Online management for everything: members, licenses, and payment. Never lose track of licenses that you’ve purchased over time. We keep the rollout super-simple: each team member handles installing Xobni on their computer or smartphone. New employees? Different employees? You can edit members and shift around licenses at any time. Just $5/person for a monthly subscription or $45/person for the annual subscription. If you have questions, we’re here for you. Xobni users are up to 300% more productive according to Exigent, a Microsoft Gold Certified Partner. Add people on your team. Assign them a Xobni product. 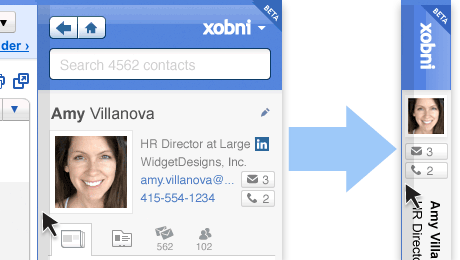 Checkout and send invitations to your team members so they can enjoy Xobni. Done! Introducing the EchoSign Gadget: Sign documents without ever leaving Outlook. While the technology we use to get work done has advanced impressively over the decades, the process of signing documents seems to have become worse since the dark ages. Why, in this day and age, do we still have to go through Rube Goldberg-like contortions of printing, pens, faxes, couriers, scanners, call-confirmations and email-confirmations to complete simple document signing, especially when most documents start as digital files anyway? Well, thanks to EchoSign, we can be done with all that. EchoSign has already built an impressively easy web-based way to send and e-sign documents that has been catching on like wildfire. Over 3 million business people already enjoy its benefits. The EchoSign Gadget allows you to review the entire document and sign it right inside of Outlook. Now your job is done! Just delete or file the email as desired. If you’re asked to sign documents often, this gadget is definitely for you. It’s just one more way that companies have used the Xobni Gadget Platform to shave minutes or hours off of tasks that their users do every single work day. Read more about how it works at tips.echosign.com or install the EchoSign Gadget today.